People have been trying to make items of clothing waterproof for hundreds of years. As early as the thirteenth century, Amazonian Indians used a milky substance (rubber) extracted from rubber trees for this purpose. When European explorers came to the Americas in the sixteenth century, they observed the indigenous people using a crude procedure and rubber to waterproof items like footwear and capes. By the eighteenth century, Europeans were experimenting with waterproofing fabric for clothing. François Fresneau devised an early idea for waterproofing fabric in 1748. Scotland's John Syme made further waterproofing advances in 1815. In 1821, the first raincoat was manufactured. Made by G. Fox of London, it was called the Fox's Aquatic. The raincoat was made of Gambroon, a twill-type fabric with mohair. While these early attempts at waterproofing fabrics sometimes involved rubber, they were not particularly successful. When rubber was used in clothing, the articles involved were not easy to wear. If the weather was hot, the clothing became supple and tacky; if cold, the clothing was hard and inflexible. This problem was solved in the early nineteenth century by Macintosh. The native of Scotland was a chemist and chemical manufacturer. Through experiments, Macintosh discovered a better way to use rubber in clothing. At the time, the gas industry was new. Coal-tar naphtha was one byproduct of the fractional distillation of petroleum, which was used in gasworks. This volatile oily liquid was a hydrocarbon mixture. Macintosh dissolved rubber in naphtha, making a liquid. This liquid was brushed on fabric making it waterproof. In 1823, Macintosh patented his process for making waterproof fabric. This process involved sandwiching a layer of molded rubber between two layers of fabric treated with the rubber-naphtha liquid. It took some time to develop the industrial process for spreading the rubber-naphtha mixture on the cloth. The patented waterproof fabric was produced in factories beginning in 1824. The first customer was the British military. Macintosh's findings led to other innovative uses of rubber, including tires. The process for vulcanizing rubber was developed by Charles Goodyear, a hardware merchant in Philadelphia, Pennsylvania, in 1839. Vulcanization means to heat rubber with sulfur, which made rubber more elastic and easier to meld. Four years later, Thomas Hancock took the waterproof fabric invented by Charles Macintosh and made it better using vulcanized rubber. Americans continued to improve on Macintosh's process with the advent of the calendering process in 1849. Macintosh's cloth was passed between heated rollers to make it more pliable and waterproof. Another innovation involved the combination of only one layer of cloth with a layer of rubber. While such improvements made the cloth lighter than Macintosh's original, these raincoats were still rather hot even into the early twentieth century. Many raincoats were designed with slits to make them cooler for their wearer. Macintosh's fabric was not the only kind of waterproof fabric invented in the nineteenth century. In 1851, Bax & Company introduced Aquascutum. This was a woolen fabric that was chemically treated to shed water. This raincoat became popular at the end of the Crimean War (c. 1856). Chemicially treated fabrics gradually began to predominate by the early twentieth century. For World War I, Thomas Burberry created the all-weather trench coat. The coat was made of a yarn-dyed fine twill cotton gabardine. The gabardine was chemically processed to repel rain. Though these trench coats were first made for soldiers, after the war ended in 1918, they spread in popularity. They were also much cooler than those made of Macintosh's fabric. By 1920, raincoat design moved beyond the trenchcoat, though that coat remained a classic. Oil-treated fabrics, usually cotton and silk, became popular in the 1920s. Oil-skin was made by brushing linseed oil on fabric, which made it shed water. Car coats were introduced in the 1930s. These raincoats were shorter than trenchcoats and made for riding in automobiles. Rubber-covered and-backed raincoats, made of all kinds of fabrics, resurged in popularity between the wars as well. After 1940, raincoats made of lightweight fabric became more popular. Military research led to the creation of raincoat fabrics that could be dry-cleaned. Vinyl was a preferred fabric in the 1950s for its impressive waterproofness, as was plastic (through the 1970s), though such raincoats retained heat. Innovations in fabrics continued to affect raincoats. Wool blends and synthetic blends were regularly used to make raincoats beginning in the 1950s. Such blends could be machine washed. There were also improved chemical treatments of cloth. Heat-welded seams were introduced as well, increasing how waterproof the fabric was. In the 1960s, nylon was used to make raincoats, and in the 1970s, double-knit became a preferred fabric. Double-knit raincoats were not as water repellent as those made with other fabrics, but were designed differently to compensate. Still such raincoats were not as comfortable, and double-knit faded throughout the decade. Vinyl raincoats briefly had a renewed popularity, especially among women. 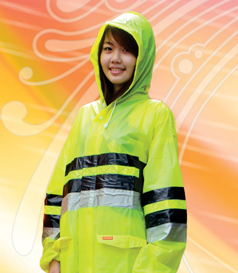 Modern day raincoats come in many fabrics, styles and colors. The gabardine trenchcoat remains a favorite. While natural and artificial blends, rubber and plastic are still used, plastic-coated artificial fibers used for Gore-Tex are very popular. Microfibers and other high-tech fabrics are taking over more of the raincoat material market.